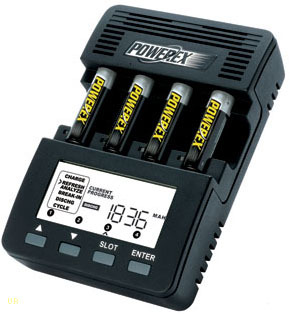 For home use, the batteries only last about 9 hours, making recharging a constant chore I’d rather avoid. I find the best thing for the ac adapter is a snap on ferrite core. It doesn’t get rid of all of the powerline noise, but most of it. Most of the common ones have enough attenuation down to a few mhz if the wire is wrapped around the ferrite a few times, counts as three turns. Most of the cheap switching mode adapters on Ebay and elsewhere produce a ton of rfi no ferrite will block enough of it, avoid them at all costs and stick with transformer based ones. I have used NIMH, however I currently use Enloop ready to use rechargeables, along with the Maha-C808M which charges D,C,AA & AAA. I too keep a portable Maha charger just for traveling (MH-C401FS) which can be used from the wall, or accessory outlets in most vehicles. The whole solar thing however is a problem as most chargers just don’t have practical charging characteristics. If needed, just plug a solar panel/controller into your vehicle outlet to keep the battery or batteries charged up, then charge your portable batteries at will. For those situations when you need total portable operation with no wall or vehicle outlets available I would recommend something like the Anker Mobile Power battery (Model 79AN20L) a Li-polymer battery (20000mAh/74Wh). It comes with a wall & vehicle plugin, and can be charged with a suitable solar panel/controller allowing stand alone portable power with outputs of DC 12/16/19 volts, and a 5 volt USB outlet it will provide virtually any portable power need. As to the new 3.7 volt cells now obviously beginning to be used, as well as the now common 3.0 volt (CR123A) batteries, found in many flashlights today… Rechargeables like those found in the new Tecsun, and rechargeables (such as the 3.0 V Tenergy RCR123A) along with respective chargers will fit right in. Yes the Tecsuns with USB plugs can be run/charged from all battery options (vehicle/Ankers) giving complete flexibility and low/no noise like wall-warts do. What a cool setup, Tim. I bet you do get some looks at Starbuck! Take it to an airport–where there’s one outlet per 300 people–and you’d make even more friends. Thanks for sharing! There’s another good reason to run your portable using batteries. If you’re using a computer to decode digital signals, or to record what you’re hearing, there is far less noise on the audio input (from radio to computer) when the radio is not connected to the AC mains. I don’t know if this is because noise on the AC is making it into the radio’s audio output socket, or if there’s some sort of ground loop effect happening (because the connection between radio and computer means the entire system now has two separate paths to ground) but switching the radio to batteries makes the audio much better.